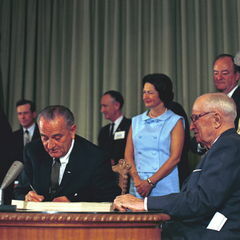 Fifty years ago this Thursday, July 30th 1965, President Lyndon Baines Johnson signed into law legislation creating two new national health insurance programs, Medicare and Medicaid. Fifty years later, these programs appear as recognizable and durable as any monuments in Washington DC. That’s an illusion because there’s little difference between the Lincoln and Jeffers on Memorials today versus 1965. On the other hand, Medicare and Medicaid today look radically different from the law signed by LBJ as former President Harry Truman looked on. If there is one constant in Medicare and Medicaid, it is change — constant, persistent change to fit the needs and preferences of the time. Both programs have been works in progress for 50 years, and so it continues. 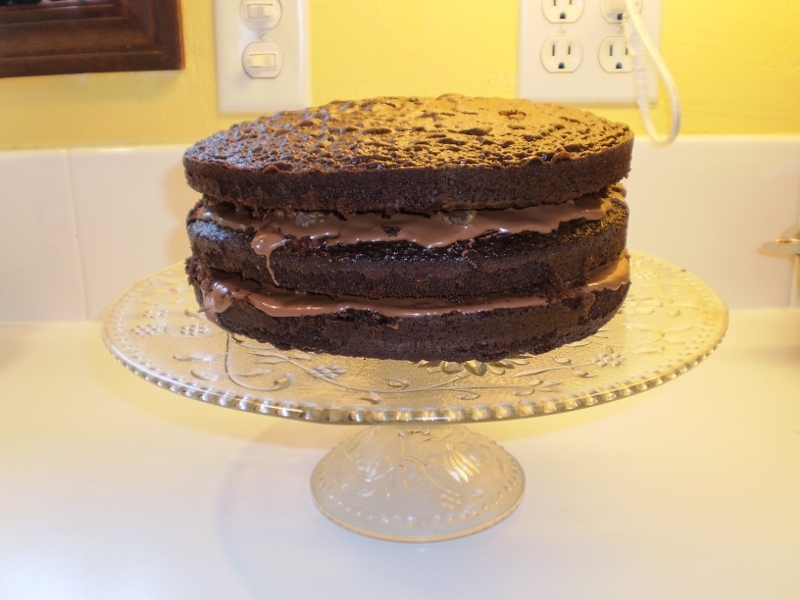 The law’s original metaphor, coined by then-House Ways & Means Chairman Wilbur Mills (D-AR), was the “three layered cake.” The bottom layer was Medicare Part A — the original Democratic proposal for hospital insurance, funded by new employer/employee Social Security taxes deposited in a new Part A Hospital Insurance Trust Fund. When reference is made to “Medicare going broke,” it means this Trust Fund. When debate over the legislation that became the Affordable Care Act/Obamacare began in 2009, the Fund was scheduled to have insufficient funds by 2017 — last week’s new Trustees’ report now pegs the Fund’s financial reserves as solid through 2030. The second/middle layer was Medicare Part B — payment for physician services, funded by enrollee premiums and government revenues. During the original Medicare debate, Democrats wanted what became Part A and Republicans pressed for what became Part B. It was Wilbur Mills’ inspiration to combine them into a single program. This past March, Congress passed a new law overhauling physician payment in Part B. Parts A and B make up what is often called “Traditional Medicare,” a federal insurance program with no state government involvement. The third layer was Medicaid — a new federal-state program to provide medical benefits for low income mothers and their children who were on “welfare” or public assistance. The law required the feds to set national rules and left administration to states with lots of discretion. A more appropriate metaphor — less tidy than Mills’ — would have been to describe Medicaid as 51+ (including DC and US territories) marbled cupcakes. 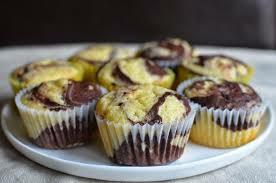 The saying goes: “if you’ve seen one state Medicaid program, you’ve seen one state Medicaid program.” Because of changes brought by the ACA, Medicaid today is more a national program with uniform standards than ever — still it is 51+ marbled cupcakes, each one different from the rest. In 1965, Medicaid was an afterthought — a make-shift, temporary caboose on the bold, new federal Medicare system that many expected/hoped would expand to cover all Americans within several years. In his definitive book on Medicare’s creation, “The Politics of Medicare,” Ted Marmor did not even mention Medicaid. Today’s ACA-reformed Medicaid covers more than 70 of 320 million Americans (Medicare covers about 54 million). It is the nation’s largest health insurance program covering 40% of all our children and paying for 40% of the nation’s births, the largest payer for nursing home and long-term care, and so much more. Sure, 19 states are still refusing to expand Medicaid as permitted by the ACA. History tells us they will come around — the last state to join original Medicaid was Arizona, and not until 1982, 17 years after the program’s creation! I continue to predict that all 50 states will be in no later than 2020. More than Medicaid, though, Medicare has become the undisputed driver of health system reform in the US and around the world. In the 1965 law, Medicare was required to pay hospitals and physicians their “usual, customary, and ordinary” fees, a mega-inflationary scheme if there ever was one. In 1983, under “conservative” President Ronald Reagan, Medicare became the world’s biggest government agent for administered prices with the creation of the Inpatient Hospital Prospective Payment System (PPS), with Diagnostic Related Groups (DRGs) as the price-setting tool. Today, DRGs are one of the most familiar hospital payment forms around the globe. Today, Medicare is much more than traditional A+B. It now includes C+D — (“new” Medicare). C has had several names during its 40+ year history, prominently “Medicare+Choice” between 1997 and 2003, and today’s “Medicare Advantage” by which enrollees get Medicare benefits managed by a private health insurer, now covering about one third of all Medicare enrollees. Part D was established by Congress in 2003 to provide, for the first time, an outpatient prescription drug benefit for enrollees managed by private drug plans. There’s no mandate, but if enrollees don’t sign up when first eligible, they pay increasingly higher premiums for the rest of their lives! But it’s not a mandate, so they say. Understanding the politics of Medicare is much more straightforward if you remember this: Democrats like A+B, traditional Medicare because it is government-paid fee-for-service which keeps insurance companies out of the picture (except for Medigap coverage — another topic!) and tend to dislike C+D because of these programs’ reliance on private health insurers. By contrast, Republicans detest A+B as government bureaucracy, and love C+D because both rely on private insurers. Understand this, and everything becomes easier. Below, I also add Medicaid and the Exchanges to the political mix. ACA Health Exchanges + ?@%&! Republicans also tend to loathe and despite Medicaid because it is government provided health insurance. One irony is that, today, most states require that Medicaid enrollees get their coverage through private Medicaid managed care plans run by private insurers. Go figure. While the ACA established yet a third pillar to the US health landscape in the form of Health Insurance Exchanges/Marketplaces to provide subsidized private health insurance to Americans unable to get insurance elsewhere, Obamacare also made dramatic changes to both Medicare and Medicaid, reinforcing my premise that these program always have been, and continue to be, works in progress. The ACA not only expanded greatly who is eligible for Medicaid (to all non-elderly with incomes below 138% of the federal poverty level [$15,654 in yearly household income for a single adult]), it established for the first time national eligibility and enrollment standards. Though the Obama Administration is permitting all manner of experiments in conservative states (i.e. : Arkansas, Iowa, Indiana) hoping to “get to yes” on eligibility expansion (because of the 2012 US Supreme Court decision that made the ACA expansion an option rather than a requirement for states), Medicaid looks more like a national program today than ever before. Meanwhile, the ACA accelerated Medicare’s role as a national delivery system reform engine through initiatives such as Accountable Care Organizations (ACOs), bundled payments, penalties on hospitals with high rates of readmissions and patient injuries, and much more. In US health policy today, Medicare is driving the reform agenda as the private sector follows and innovates in Medicare’s footsteps. As someone who follows US health policy developments closely, I am constantly amazed by the daily and incessant deluge of news relating to both Medicare and Medicaid. Lots of these stories offer hyperbolic predictions of impending doom and calamity — this one I read today by Joe Antos of the American Enterprise Institute predicts that Medicare will be the next Greece! Fifty years of Medicare and Medicaid and the pace of change just keeps accelerating — for better and worse. While many Americans fervently wish we could just have one solid federal health insurance pillar, now we’ve got three (not even counting the Veterans Administration and Tricare). I’m an optimist and believe that our system is getting better. I think that’s true most and not all the time. What’s undeniable is that our major health programs are works in progress, constantly moving and changing. Here’s hoping that in the next 50 years, we will find a more stable and durable solution for all Americans.